This book was kind of a let down. I didn't know much about it going in except it included a racy relationship between a 15-year-old boy and a 30-year-old woman and it took place in the past. Turns out it's about the Holocaust and the post-Holocaust generation; a subject I typically find incredibly interesting. Despite the raciness and historical setting, as a whole I found this book to be on the boring side. It had the potential to be good but for me the writing felt flat and the storyline was lacking. If it weren't so short I would have DNF'd it. I know I'm in the minority on this one; the novel is in Oprah's book club and Goodreads is littered with five star reviews. It just wasn't a book for me. Thanks Brenna, I trust your judgement and will join you in the minority on this one. That rots that the book was such a letdown. I expected more from it, too. Now that I've read your post, I'm thinking I'm going to put my copy into the giveaway pile. Thanks for the honest post! Aww I feel a little bad about making you want to toss your copy. Honestly though, there are better books out there, IMO. I read this book and remember quite liking it. Thought it reflected innocence well, by putting it up in contrast with complete loss of it. Not everybody's cup of tea, I suppose. It's the kind of book I would've found painful at 500 pages, but since it's so short, thought it packed a punch and made its point properly. 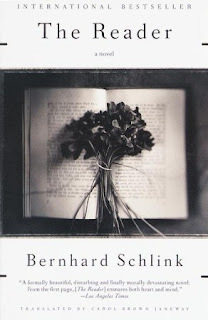 I did think some of it was interesting, namely how Schlink gave us the perspective of Germans post WWII and how they viewed the agenda, but I wanted it to be taken one step further - I wanted to feel something. Instead I was left a little bored. Like you said, not for everyone. I read this ages ago, before the movie ever came out, and I think I felt the same way. Of course I think I was a little too young to fully grasp the plot and at the end I wasn't even sure of everything that had happened. But my impression of it hasn't made me want to go back for a re-read. Have you seen the movie? I haven't seen the movie and now I have little interest in it. I read this some time ago and remember nothing about it. I don't think it made a huge impression on me, either. I think I remember feeling "meh" about it. When I sat down to write this little review I thought that's what I'd like to write, a one worded review that reads "meh". Hmmm... I've toyed with getting this every time I go to a goodwill (have you seen them there?! I think that's the only place they're sold). Anyway. That's a bummer. I got mine at Half Price Books! I feel like they are sold second hand A LOT. I didn't like the movie that much, so I never tried to read the book. I didn't see the movie. Probably never will now. It's a shame you didn't get this book, because it really is a brilliant piece of writing and actually quite moving. The whole book is a metaphor for German post war guilt. One generation blaming the prior for the shame brought on the nation by fascism and the holocaust. I personally don't think the writing was flat at all, I found it quite honest and self aware. Maybe you need to know a bit about German history to fully appreciate its quality. I "got" it and in my opinion it still sucked. Maybe if it weren't so trite - loss of innocence as a metaphor for the war? There is an overdone conceit. I read Anne Frank when I was 9 - and reread it in college when I studied German history - and she conveyed that idea more passionately than Schlink did. It's a shame that you don't understand that everyone has different reading tastes and even though they may not like something you deem "brilliant," it doesn't mean they didn't understand the underlying meaning. I thought it was solidly OK. Nothing more. I haven't read this one, but I did listen to Harriet Lane's interview with the author on World Book Club. I'm going to sound like an advertisement for a moment, but I absolutely love listening to these podcasts; I hadn't had any interest in reading this book before, but after listening to the show, I added it to my TBR list, which happens to me after nearly every episode (and if I've already read the book, I want to re-read it). Thanks for sharing! I'll check that out.